I saw an article about one of these and found the other. I just wish the Blackbird camera did medium format but i guess its easier and cheaper to process 35mm but like i said before its cheaper to just go digital but you would lose the unique imperfections these cameras would give you. I want to get these. Just to be a little selfish. The twin lense can shoot in several different ways. It can crop and make the image in a square format or you switch it to normal format or take out the frame entirely and have the image go all the way to the edge of film to the sprocket holes. The other is a fish eye plastic toy camera. The special thing about this camera is the flash ring which does cool things to the subjects of the photo. 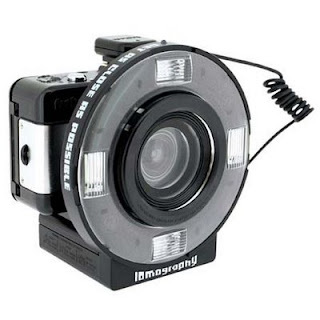 I could get this camera for about half the price without the flash ring but thats what makes it so cool. And i would totally use it so why not invest in that right?